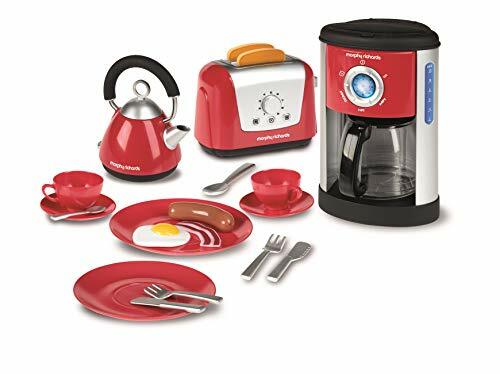 Treat mummy and daddy to breakfast in bed with this complete Morphy Richards kitchen set. This realistic kitchen set comes in a beautiful red finish, ready for your little one to explore their imaginations in a play kitchen environment. With a fillable coffee maker which allows water to pour into the coffee pot, kettle with the level gauge indicator, toaster with pop-up toast and an extensive range of colourful crockery, cutlery and even play food it is great for the imagination. This set will inspire lots of make believe cooking adventures, and there is enough for friends to play together, too.